Long before a single frame of this movie flickered on the screen, there was no doubt I would absolutely adore this classic from Bollywood's b/w era. A period piece dating from the Mughal era coupled with the music and songs of Naushad were enough to know that this movie would be something special and indeed it was. 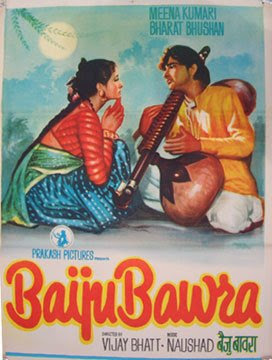 Starring Bharat Bhushan (who often got the nod as the lead only after the script was turned down by the Big Three of Raj Kapoor, Dilip Kumar & Dev Anand) and Meena Kumari, 'Baiju Bawra' was a landmark film in the era of post-partition India. The story is a grand one and based on the true legend of Baiju, the son of a musician during the reign of King Akbar. Set in a time when emperors and their courts carried great weight across the land, Baiju challenges the king's singer Tansen (often considered the greatest musician insofar as Indian classical music is concerned) to avenge a promise he made to his dying father. 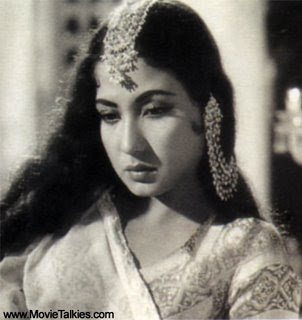 Along the way he meets and then falls in love with a lovely village girl played by THE tragedy queen of her day, Meena Kumari. 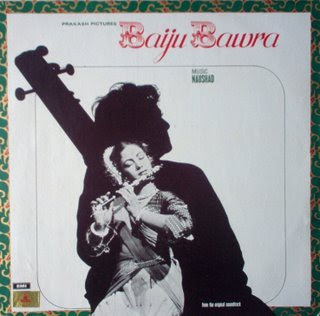 "The music he composed for Baiju Bawra surprised even me as it was entirely different from what he had done before. Different ragas were used for different situations and the purity of the ragas were maintained to the greatest possible extent." The songs for today are wonderfully original and visually paint an India in my mind that evokes a romantic vision of my ancestral homeland. Since the plot of the movie revolved around music it was essential that the songs be special and blend both classical as well as the music of the day - Naushad did so with incredible deft and grace. The first one, Door Koi Gaye showcases the talents of two very different singers, Shamshad Begum with her classical nasally delivery as well as Lata who was in the infancy of her career with her trademark high but sweet voice. The sound of 'matlas' (earthen pots used to carry water on the heads of the fair maidens) mixed in with the sound of the sitar and flute that lead into a full fledged orchestra was just something not heard in filmi songs back then or even now. The video provides a great contrast between the (sometimes) overblown production values of today's films and the simple yet elegant ones of yesteryear. The second one, Tu Ganga Ki Mauj is the song that won Naushad his version of India's Oscar and cemented Mohammed Rafi's status as one of Bollywood's leading playback singers until his death in 1980. Again it's the music that provides the foundation for the Rafi's amazing vocals. This romantic tune's video culminates with a very 'Wizard of Oz' type ending in which all the villagers tell Meena Kumari's character to essentially, follow the yellow brick road to her true love. This movie is a music lover's delight - every song is a gem! O Duniya ke rakhwaale and Man tarpat hari darshan ko aaj used to be my favorites but now I dont think I can pick any favorites - they are all so good in different ways. I agree with bollyviewer !00% and really delighted to see young generation appreciating old gems. Oh what a lovely movie- ad yes the songs bring back memories of home. Thank you for writing this Sanket. This is one of my favorite soundtracks ever! It took me some time to get used to more classical sounding songs, but now I love it so much. Every song is good! Yes, this is a classic movie in every sense...I always identify Bharat Bhushan with this movie and that 'tu Ganga ki" song....I liked Bharat Bhushan in this and 'barsaat ki raat' with Madhubala...both wonderful....ughh...they don't make movies and music like that anymore. Bollywood is like a 'magic eye' puzzle - either you just get it or you don't.